Mark Henderson, the preacher of the Quail Springs Church of Christ, was asked about his churches plan to introduce instruments into the worship. This is part of the Q & A in the Oklahoman newspaper. The question that comes to my mind is where does Mr. Henderson find the authority to do this? If I ask the straight forward question: “Mr Henderson, it is OK with God for me to worship with instruments?” He answers, “Yes, it is acceptable to God.” How does he give others the “freedom” to do so. His choice gave 300 the freedom to exit the front door. The Quail Springs action is a shining example of change agent methods. The principles of following Scripture are being obscured for the greater good of building a large congregation. For years, Mr. Henderson says, they treated it as a “nonissue”. The truth is, it was not a “nonissue” to many in that congregation. No doubt, many who disagreed with him were tolerated for believing it WAS an issue. This is a reminder for all of the faithful children of God to remain vigilant. When the slick preachers say that “it doesn’t matter to God”, remember they don’t have a private discourse with God on the matter. What they are really saying is that it doesn’t matter to them. On reading the justification given by Elders and preacher from Quail Springs for this change, one gets the sense that it’s more about pleasing people than it is anything else. They know that people will come or go on the basis of instrumental music. The principle of offering only “spirit and truth” worship that pleases Jehovah is relegated to secondary importance.. 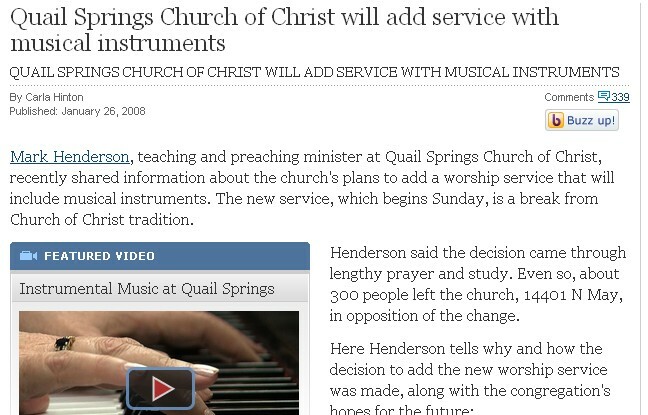 The news story on the change at Quail Springs said that when the Elder finally addressed the congregation to break the news that they were moving forward with the plan to use instruments, the congregation broke out in applause, except for some who left in tears. Applause! Applause? If there was any demonstration of a wrong spirit at Quail Springs, that was it. What kind of spirit-filled congregation breaks out in applause over such a thing? ‹ TAX UNTO WHOM TAX IS DUE? So if some want to say that very few left due to this decision, they don’t have the facts. I would venture a guess that the 300 who left were people of conviction. They were the ones who were unwilling to “embrace discomfort” by being part of a church gone denominational. I wonder if losing 300 convicted people altered the overall character and doctrinal soundness of the congregation there at Quail?